The Alliance of Liberals and Democrats for Europe (ALDE), the third largest group in the European Parliament, wants a plenary debate on the rule of law and freedom in Bulgaria, group leader Guy Verhofstadt said in the wake of the January 19 2013 assault on Movement for Rights and Freedoms leader Ahmed Dogan at a party congress in the Bulgarian capital Sofia. 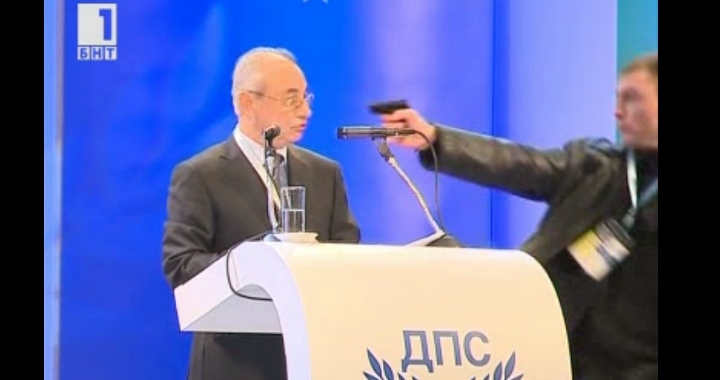 The incident, in which Oktai Enimehmedov aimed a gas pistol at Dogan on stage while the veteran MRF leader was making his valedictory speech as the party’s president, was attended by senior representatives of ALDE and Liberal International. The MRF, a minority party led and supported in the main by Bulgarians of Turkish ethnicity, claims a liberal affiliation and is a member of ALDE and Liberal International. Verhofstadt said in a statement quoted by Bulgarian television station bTV that it was a miracle that the incident involving Dogan had not ended tragically. Verhofstadt said that the incident should not be allowed to pass away lightly. Verhofstadt said that he was deeply concerned about the incident and would ask that the situation in Bulgaria be included in the schedule of the European Parliament’s upcoming plenary debates. He said that an attack on a party leader during a party congress raised more general questions about the situation of democracy in Eastern Europe. Enimehmedov faces charges of hooliganism and attempted murder and prosecutors are requesting that he be remanded in custody without bail. Reports said that he was reluctant to answer questions during interrogation about his motivation for the incident. The 25-year-old, said by Bulgaria’s Interior Minister Tsvetan Tsvetanov to have a previous record of assault and involvement in the illegal drug trade, was initially reported to be a member of the MRF and during the incident was seen wearing an accreditation badge, but the party has denied that he was a member or was known to them. A key aspect of the investigation into the Enimehmedov incident revolves around allegations that while the pistol he used was a gas pistol unlikely to be able to cause any serious harm, he also had two knives. The MRF earlier reacted with sharp criticism to the approach taken by Bulgaria’s Interior Ministry and prosecutors and called for an “international investigation” into who had masterminded the attack, in contrary to Bulgaria’s authorities who have said that Enimehmedov had told them that he had acted alone. He would undergo a psychiatric examination before a trial proceeded, reports said. It has not yet been confirmed whether a group of men who severely assaulted Enimehmedov, punching him and kicking him after he was brought down on the stage at the party congress, will themselves face charges of assault.